In the sections for files for pagers the set KOLOBOK for nConvers++. Original has appeared. This packet of smileys is made for Miranda IM connected with nConvers++ plugin. 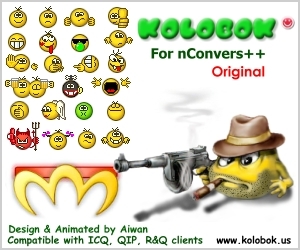 It’s compatible with codes of ICQ, QIP, R&Q and other popular codes. This set was developed and tested on nConvers++ v0.0.0.4.8. Thanks NeoJSmith for help. Render time: 0.1309 sec, 0.0050 of that for queries. DB queries: 27.